Sunday…in October. Football, mountain biking, beer drinking…is there anything else? Funny thing happened to me as I was drinking today’s beer. I was outside lubing and cleaning my bike when I went to take another sip of beer. I looked into my glass and there was a bee. Apparently he was thirsty. I had only had half of the beer at that point and the rest, with the bee, went flying onto the lawn. So what was the beer the bee decided to share with me? Appearance – Cloudy pale yellow or gold with a decent white head. Nose – Kind of faint smelling with a bit of citrus and maybe a bit of that wheat smell. Taste – A bit of banana with a lemon citrus flavor and that was about it…pretty simplistic. Mouthfeel – The body rested between light and medium. There was quite a bit of tight, prickly carbonation. It had kind of a crispness to it. Overall – Bleh…nothing to see here…move along. I hope the bee enjoyed this more than I did. Lots going on today as I am getting the house ready for the hurricane so this will be short and sweet. I did find some time for a 14 mile bike ride on some nice twisty, rooty, and rocky singletrack in Pennsylvania (Nockamixon State Park) also…again…priorities. 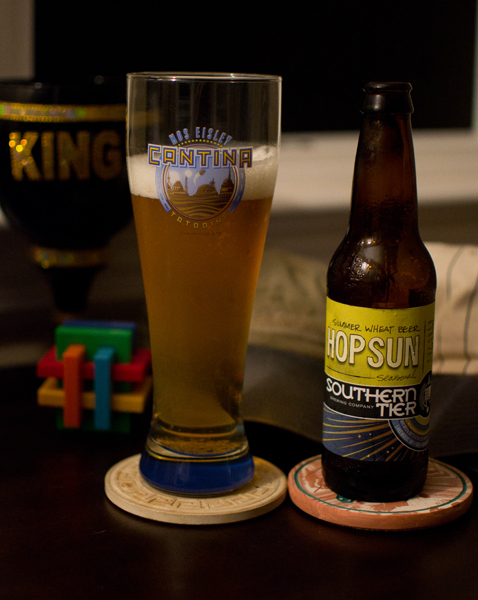 Beer #271 is Hopsun by Southern Tier Brewing Company from Lakewood, New York. This American Pale Wheat Ale has an ABV of 5.10%. It poured with a hazy dark golden color with a decent foamy white head. The nose was wheat, grains, and lemon. 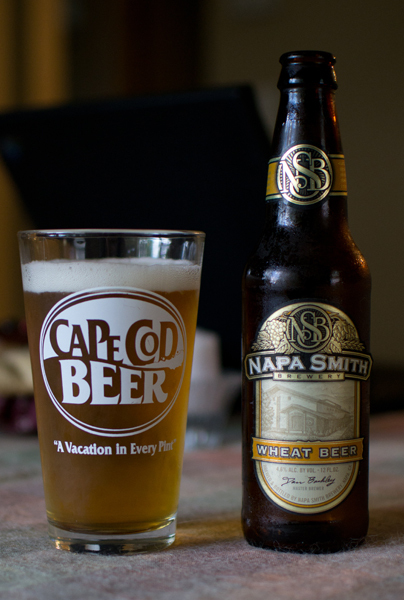 The taste was heavy in wheat as it should be but also had a nice mixture of lemon and pine flavors from the hops. The bitterness on the back end was on the low side of this light bodied brew. There was moderate amounts of carbonation in the crisp, refreshing beer. This was highly drinkable and would be quite the session beer. I enjoyed this quite a bit and think this would be a great beer on a hot, humid summer day as it was quite refreshing and pretty tasty. Going to be quick today as we are having some crazy thunderstorms and have already lost power briefly. It poured a light golden color with a one finger width what head. The nose was very light and what I mostly smelled was wheat. There wasn’t anything else recognizable in the nose. The taste was wheat and grains. There was an herbal thing going here also and a most funky aftertaste. The body was a bit on the thin side and the carbonation was a bit on the high side. Not the best beer I have ever had and though it wasn’t horrible, it wasn’t all that good either. Looks like I will have to wait a few weeks for Derek Jeter to get hit #3000. On to the 15 day disabled list he went today. Although, looking at the schedule, it sets him up nicely to get #3000 in New York…at Citi Field, home to those cross town bums called the Mets. Actually, that would would be pretty sweet. I can’t stand the Mets and I despise them almost as much as I do the Red Sox. It could be a good thing for the Mets and their money troubles though…they could keep the ball, steal his bat, and auction them off to the highest bidder. Beer #198 is Samuel Adams Summer Ale by Samuel Adams from Boston Massachusetts. This was served in a large glass on draft from Ruby Tuesdays. Stats – American Pale Wheat Ale with an ABV of 5.3%. Appearance – Pale straw yellow with a white head. Nose – Kind of light with grains, wheat, lemon. Taste – Wheat and grains up front finishing off with a lemon zest like flavor and bitterness. Mouthfeel – Medium body, nice prickly carbonation, refreshing. Not too shabby. This was a pretty good beer that was super easy to drink. Mine came with a slice of lemon. I’m not a huge fan of fruit slices in beer as I think they usually cover up bad tasting beers (Corona for example) but the lemon here complimented the beer. 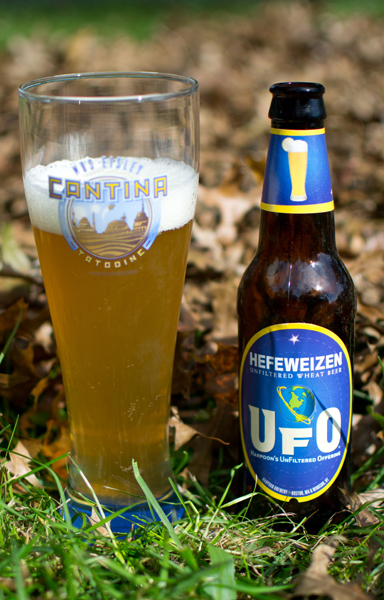 I could see this as a good backyard BBQ type beer on a hot summer day…add that slice of lemon and it could be quite refreshing. Going to be short and sweet tonight. 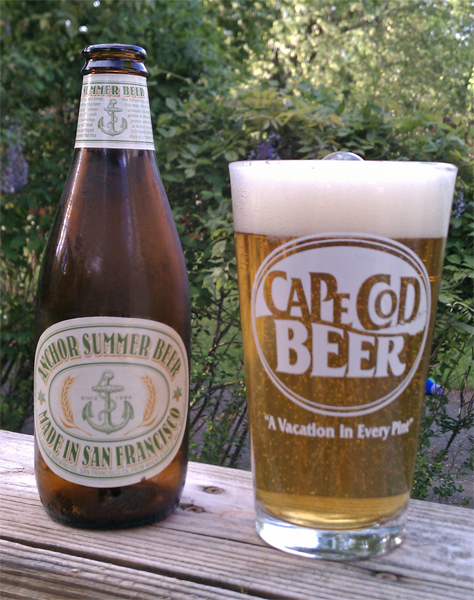 Beer #164 is Anchor Summer Beer by Anchor Brewing Company. Believe it or not…this is my first beer from the San Francisco, California based brewer. This American Pale Wheat Ale has an ABV of 4.6%. The color was a clear golden yellow and it had a gorgeous fluffy and thick white head. The nose was pure wheat…bread and bread crust. The taste was wheat and a bit of barley. It finished off very dry. It had a light body and quite a bit of carbonation. 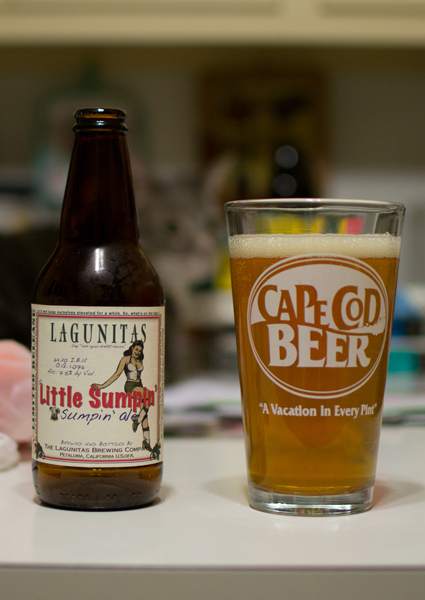 It was very crisp and an easy drinker…I could see myself enjoying these on a hot summer day. Solid brew from what I believe to be on of the older craft brewers in the USA. 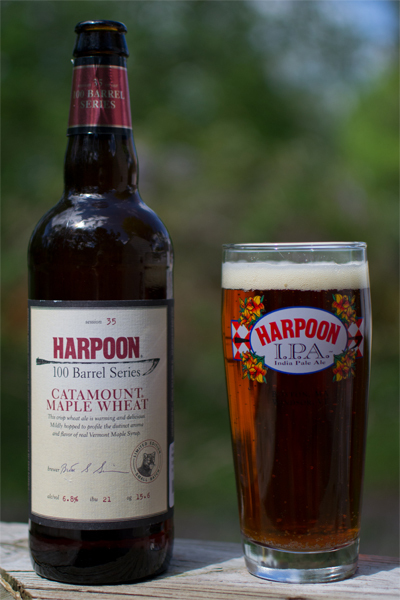 Beer #153 is Catamount Maple Wheat (Session 35) by Harpoon Brewery. Harpoon hails from the glorious state of Massachusetts. This beer is an American Pale Wheat Ale with an ABV of 6.8%. This is part of Harpoon’s 100 Barrel Series in which a different Harpoon brewer chooses a different recipe every month and brews a limited run. I finally get a chance to use my Harpoon glass that I received from Cavie (fellow beer blogger http://cavalierbeer.wordpress.com/) for this pour. Just look at that beautiful color…a nice clear amber with a small off white head. 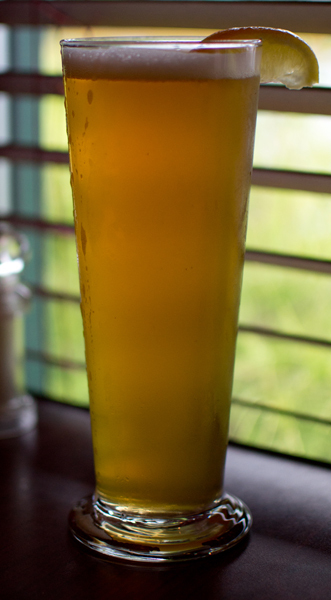 I loved watching this beer in action…there were a ton of tiny little bubbles rising to the top of the glass. The nose was subtle but pleasant, an aroma of maple was present but it wasn’t overpowering. There were also some wheat and bread like aromas. That maple was the first thing that hits you in the taste. It was also grainy with a noticeable wheat flavor. A good way to describe it would be like liquid bread. Again though, all of the flavors were very subdued. It had a lot of carbonation and a medium body. This was really easy to drink. Overall a nice beer. I enjoyed this one on my back deck while soaking up the springtime rays.